Changed title from "Free Shipping and Miniaures at Alternative Armies" to "Free Shipping and Miniatures at Alternative Armies"
Alternative Armies has a huge choice of miniatures, books, accessories in 28mm, 15mm and 6mm scales and fantasy, science fiction, historical ranges. 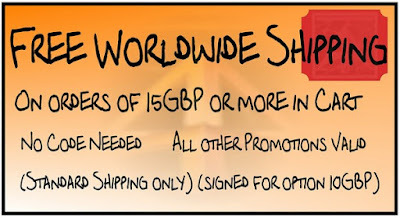 We have customers all over the world and it is my delight to tell you that until 1st August 2018 we have free worldwide shipping on all orders of 15GBP or more in the cart. Full details in the article. A great chance to try us out or fill in a gap in your collection. Plus we have two week long offers at 10% off two whole ranges and we have two brand new releases (15mm sci-fi and 28mm Flintloque) and you can get miniatures free in every order too. All our other promotions are valid and we have had the postage offer active for the last three days (we are nice like that). Have a read and a browse. Thank you for your custom. Great company, have always had good transactions with them! I can't say enough good things about Gavin and his team. Exceptional service every time. Most kind Dan. Thank you.